We had anticipated, taking the G.F.C. 's [illegible] into consideration, says the Demerara Chronicle of the 20th inst., that the match at Bourda on the 19th instant, between team representing Trinidad and the Artillery S.C., would have been productive of a keen struggle, but instead a dreadful exhibition, so far as the homesters were concerned, was witnessed. the forward line, which was much disjointed, had no chance against the combined defence of the visitors. While they did get an opportunity, the movements were spoiled by the ineptitude of one individual or another, especially Hunte and in a less degree Richter. Agwin and again Wishart made progress in admirable fashion only to be let down by either of the two players mentioned. With one or two exceptions, the home team were guilty of lunging off the ball, irrespective of altitude or direction. As regards the halves, Abraham played a great game, and although he was not assisted much by the others on the same line of defence, there was some excuse for Collier who was rather unwell. Veecock was down to play in goal, but Evelyn took the position until matters fared disastrously; then he was relegated to left half back and Veecock replaced him. Contrary to expectations, the ground was in a very fair condition indeed. The game had not been in progress long before Abraham had to commence his afternoon's share—and a big one too in the work of keeping the Trinidadians at bay. Paddenburg with a balloon kick transferred play to a less dangerous part of the field, and in doing so leaned against Eccles much to the latter's discomfort. Manly after obtaining possession, shot in from the right, but the ball was intercepted. Just after this Bullock was laid out for a spell. A very weak attempt at a clearance by Paddenburg let in Eccles, whose essay was correspondingly weak and Evelyn allowed the ball to roll behind. A rare opportunity came Richter's way. After dodging the defence and having none to beat but goalkeeper he rather solemnly, slewed the ball to the side of the post. 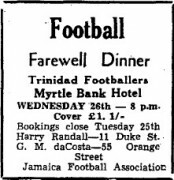 After muddling a chance Eccles more than made up for it by scoring Trinidad's first goal which came about in this wise. When close to the mouth of the goal, Eccles miskicked and the ball sailed away to the left winger, who promptly returned it to the centre. Evelyn apparently, was deceived as to its flight and Eccles rushing up breasted the ball into the net. Not very long after the restart Evelyn had to leave his charge and race Eccles and Bullock, and in doing so upset those players and what was more important, save the situation. Thompson proved himself a worthy back. Paddenburg did not play at all a bad game as his partner, but he was not always quick enough, and Thompson, thanks to his speed, was enabled to save his side time and time again from certain disaster. Hunte who missed several good openings, was very slow and gave Wishart a lot of extra work. Trinidad soon added a second point through Gordon, who put the finishing touch to a pass from Eccles. At this stage of the game Wishart put Veecock in goal and Evelyn as left half back. The Gunner's forwards sadly lacked combination, a striking contrast to the well-timed passing of the visitors. At half time the score read Trinidad 2, Artillery S.C. nil. The second half had bot been in progress many minutes before the visitors were three up. Receiving a pass from G. Brierly, Eccles rushed up and put the bal into the net and himself too, and in doing so laid Veecock out for a minute or so. The fourth goal came about in a rather curious manner. Eccles sent in a shot which Veecock fisted out to the left from which direction it was returned. Veecock got hold of the ball and then stepped back a yard or so under the cross bar and the whistle blew. G. Brierly on the left wing gave the home defence quite a lot of work in this half, and undoubtedly but for the fine clearances by Thompson the score would have been materially increased. Torrence who had been playing a most energetic and safe game and was a host in himself put in a fine shot from a distance, the ball just hitting the top bar. The fifth goal came through Bullock during a melee. Just before the curtain was timed to come down, the homesters bucked up and even flattered their supporters by the amount of energy displayed. Nothing resulted however and the Trinidadians won by five goals to nil. Mr. E. C. Crossley acted as referee. His Excellency the Governor was an interested spectator of the game, and he was accompanied by the Hon. Mr. and Mrs. G. Garnett and Major De Rinzy. Clydesdale:—Todd; Anderson and F. Brierly; McCracken, Torrence and Hoadley; G. Brierly, Rochford, Gordon, Bullock and Eccles. Artillery S.C.:—Veecock; Thompson and Paddenburg; Abraham, Collier and Evelyn; Manly, Richter, Wishart, Hunte, and D. Hutchinson.